Learning how to roll a joint is an essential stoner skill. Glass breaks, is expensive and is hard to travel with. Joints, on the other hand, are, well, the opposite of all that. Today, I’ll teach you not only how to roll a joint for beginners, but also various joint rolling techniques and tricks that will have you rolling perfect joints, every time! Before you learn who to roll, you need to think about how you need to get your cannabis ready to be rolled. There isn’t much that goes into the preparation of a joint, but I wanted to talk a little bit about how to prepare the cannabis for one. Some smokers like to use grinders, and you really can’t go wrong with that. If you grind up your bud to finely for a joint, however, it can lead to a joint that ends up being hard to hit and gets bogged down with resin. When rolling up a joint, it’s always best to go with a somewhat rougher grind. Aside from that, make sure you have some good joint papers and maybe a rolling tray. Now, there comes a time in every smoker’s life that they get caught with nothing to smoke with and nothing to roll with. When this happens, you can either go full on engineer and try to make a homemade bong or find something creative to roll a joint with. After all, joints are healthier than bongs. But a word from the wise, don’t use anything other than real joint papers to roll up. True, you can use a gum wrapper with the aluminum peeled off or corn husk or even printer paper. Be patient, make a gas station run and enjoy cannabis the way it was meant to be enjoyed. If you came here to simply learn how to roll a joint, this section is all you’re going to need. This will break down step by step how to roll a joint. No tricks or fancy equipment, just the tried and true, old school way. You can either watch this video or, if you prefer, you can read how to roll a joint step by step. Before you can roll, you need to prep everything. As mentioned earlier, you can use a grinder or a rough finger grind to prepare your cannabis. You can also use scissors or any other homemade grinders. I recommend you play around with different methods to see which you like the best because they do not all smoke the same. Now, take your paper and fill it with the shake you got from grinding your cannabis. If you’re using a filter, place it at one end of the joint. Usually, a good amount of cannabis for a joint is around a half gram (you can weigh it out with a scale if you want). With one hand holding the paper, use your free hand to shape the joint by moving the cannabis around to where it’s evenly distributed across the paper. 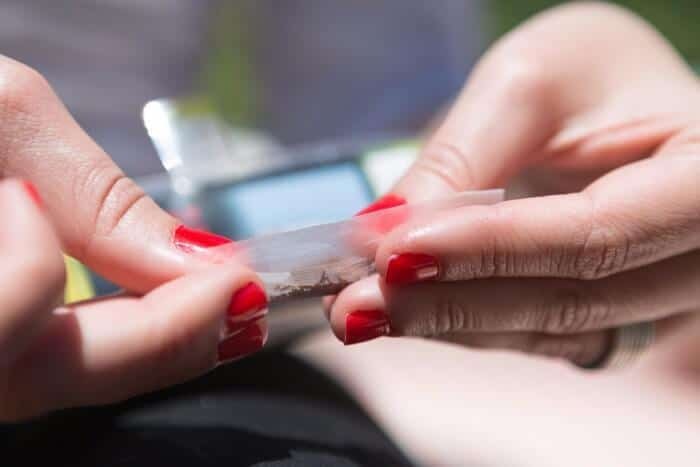 A lot of beginners tend to roll joints with fat bellies. Take the time to shape the joint properly. So you’ve got the joint loaded and shaped, now is the time to roll it up. Do so by pinching the paper between your fingertips and slowly roll it back and forth to pack the cannabis down. Once you see it taking the shape of a joint, it’s time to go to the next step. Everything up to this point has been easy. Now is the time that the great joint rollers separate themselves from the beginners. Start by tucking the unglued side of your paper into the roll. Lick the glued edge of the paper and roll one end down to hold it into place. If you’re using a filter, roll this end into place first. It makes it easier and helps guide the paper as it rolls around itself. Slowly, work your way down the rest of the joint, tucking and sealing the joint as you go. Now that you have a rolled joint, you should pack it to ensure an even burn. You can pack it by either using something like a pen to pack the cannabis down through the top of the joint, or you can pinch the top of the joint and lightly flick the joint back and forth till it packs down. Filters are also called crutches or tips. The idea behind them is they allow you to smoke more of your bud instead of being left with an unsmokeable roach. You also can smoke a joint a little bit better because it helps fight the resin clogging that usually happens at towards the end of the joint. To make one, it’s best to use a thin cardboard like a business card. Some papers even come with crutches built in, or you can just use an empty paper box. RAW also makes some packs of just filter papers that, of course, work perfectly. They’re pretty easy to make. Just make a couple of accordion folds on one end of the cardboard (basically, fold the end into a W) and then roll it up thick enough to match the width of the joint you plan on rolling. Again, it’s not required to use a filter for your joints, but they do prevent scooby snacks (swallowing cannabis), make the joint more stable and make it easier to smoke. Now, rolling a two paper joint is exactly like rolling a single paper joint. The only thing you need to learn is how to attach the two joint papers. There are two different ways you can go about doing it. 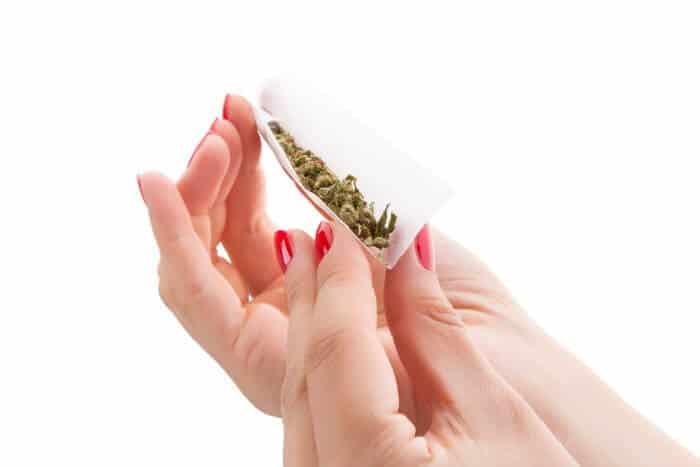 The first way is the preferred method that is easier to roll, and that’s to take the second paper and attach it by shaping the two papers into an L shape. You can see how it’s done in the video below. The other way to roll a two paper joint is by attaching the papers slightly overlapping each other. While this one sounds cooler since it will be a bigger joint, it tends to be pretty unstable and clog up from massive resin build up. You’re better off rolling up a blunt. Using a joint roller is one of the easiest ways for beginners to learn how to roll joints. The concept is pretty much the same as rolling one free hand, except the machine does the work of holding the paper in the right place for you. First, grind up your bud with a couple of twists. Take the joint roller and make sure it’s not locked into its tightest position, push the apron down and fill the chamber with your bud. Make sure that the bud is evenly distributed in the joint roller machine. If you’re using a filter, you can place it on either end of the joint roller. Now, you need to close the joint roller. You may have to push the bud into place with your finger to close it. Word of caution, though. Don’t put too much cannabis in the roller. If you have to cram the stuff in there forcefully, the joint will be too tight to smoke. Give the roller a couple of rolls without the paper to get the bud settled into place. Next, grab a paper, making sure the adhesive is facing you, place the joint paper in the opening of the roller. Once in place, roll down. It’s important to roll down, or the adhesive will be on the wrong side. The key here is to just lightly roll it up. Rolling machines can easily roll joints way too tight, ruining the entire experience. Roll it until just the adhesive is sticking out of the top and lick the glue before giving the roller a final roll finishing the joint. You’re not going to be smoking a dollar bill! Instead, you’re using the dollar bill as a makeshift joint roller to roll perfect joints quickly and effortlessly every time. Usually, when I’m asked to teach a beginner how to roll a joint, using a dollar bill is the first method I go to. It’s like joint rolling with training wheels, and it helps you perfect the motions. First, you need a paper, some weed and a dollar bill. Fold the dollar in half and place some ground up bud in the middle of the dollar. Spread the cannabis out evenly. Now, fold the dollar bill back in half keeping the cannabis at the crease in the bill. 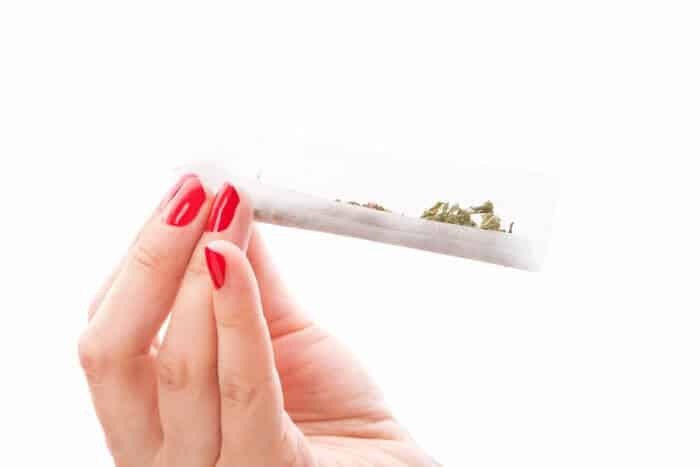 Using your thumbs, work the bud towards the bottom of the crease by slowly rolling the dollar back and forth. Next, roll the dollar bill down to where the end of the dollar is just covering the weed. Holding the dollar in place with one hand, place the joint paper in the opening with the adhesive facing you (just like a joint roller) and lick the adhesive. Rolling a joint with hash isn’t any different than rolling a normal joint. You can use any of the joint rolling techniques mentioned above to do it. The whole idea behind it is just putting hash in your joint. There are right and wrong ways to put hash in your joints, though. If your hash is very dry, like compacted kief hash is, use a knife to scrape off some of it into the cannabis you have prepped for your joint. If the hash has a more play-dough consistency, then take a little bit of it and roll the hash until it’​s a long and very skinny line of hash. It needs to be roughly the same size of the joint. 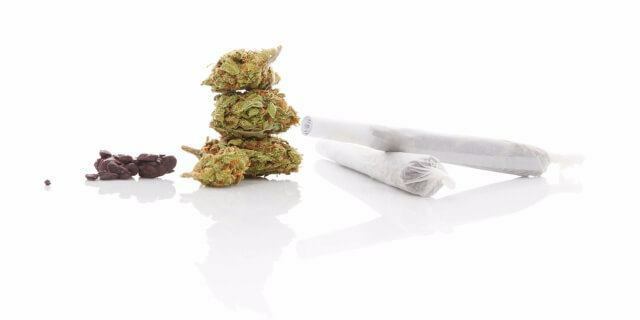 Place the hash on top of the weed and roll it up. From my experience, if you just tear off pieces of hash and throw them in the joint it smokes unevenly and causes the joint to run once you get to a chunk of hash. These methods distribute the hash evenly creating a better smoke. If you’ve managed to make it through this extensive rolling guide, I think it’s safe to say you can roll a joint now. At the end of the day, it takes practice. Perfection is only achieved through repetition, and it’s only natural to struggle at first. Remember, we can’t all be Tony Greenhand. Don’t worry, though, it’s a ride of passage, and once you master it, it will be a skill that never leaves you. Anything you would like me to add to this guide on how to roll a joint for beginners? Did it help you get over the hump and start rolling some masterpieces?